Log prices are at record highs, and mills are in extreme competition for logs. The log shortage is leading to maintenance shutdowns, extended Christmas holidays, and one mill closure. Recent trends of lumber, logs, home construction, and housing markets, are compared. * A lumber board foot measures 12 inches by 12 inches by 1 inch. A log board foot is based on the log volume required to recover a board foot of straight lumber from round, tapered logs, using industry standard sawing patterns that vary with log diameter. The leftover wood, bark, and sawdust, are used for paper, fiberboard, and electric power, but are not included in the log board foot measure. Two loads of Northwestern logs make enough lumber, panels, cabinetry, and other wood products to build a new home. The headliner this month is log prices. Logs are in short supply and log prices are way up, a new October record. While log sellers are guardedly ecstatic, one local mill operator was exasperated at being beaten in a recent auction, when the logs sold for $975 per thousand. Of course that is probably an outlier high price. 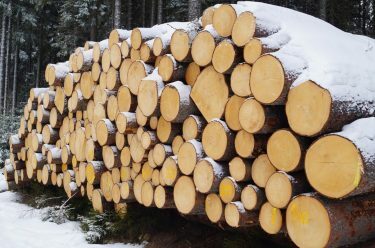 In this column, we report the average monthly log price for #2 Douglas Fir logs, but this is still new territory for price. At that price, nearly 2.5 times last months stud price, margins get thinner for manufacturers. Some operators will buy a sale, at an outlier price, and average the price of those logs with their other logs, just to keep the mill running and not shut down. More seriously, one local mill has told me they are STILL only running one shift, as reported last month, because they cannot get enough logs for two shifts. Others are planning to take extended Christmas holidays and longer maintenance shutdowns, due to the log shortage. The log shortage is a very serious problem. Competition for logs among manufacturers is currently extreme. The $975 log report, and other similar stories, will be a part of the calculus of next month’s reported log price. It looks like winter prices will remain strong at least for the short term. As also reported last month, people continue to be frustrated because all around us, trees are growing and they cannot be harvested. Western Oregon federal forests (52% of Douglas County, Oregon land) continue to build live tree inventory, way beyond historic levels in individual stands. Die-off then occurs, lightning strikes (or people are careless) and fires burn especially in our dry summers. Even after the fires, salvage logging is a fraction of what it could be. Little or no regeneration harvest takes place, not even using contemporary practices that retain forest legacy and diversity — variable retention regeneration harvest — intended to mimic the natural forest condition, where fire used to burn without restriction. Beyond the woes of the log shortages and price, lumber prices do look pretty good compared to $300 a year ago. Interest rates remain attractive for buyers, and unsold home inventories remain attractive for sellers, while the average price of a new home continues to climb. Ironically, homebuilding has stagnated, and is similar to the level of 10 years ago (2007), when we were at recession levels in the economy. Then, lumber price then was half the price it is today, and logs were at a very low price, albeit in line with product prices. There are effects when log supplies get as tight as they are now. This week, Fruit Growers Supply in Yreka, California shut down a mill that simply cannot produce cheaply enough, relative to log prices, to make ends meet. They laid off 35 people with family-wage jobs. The mill produced pallets, boxes, and crates for fruit storage and shipping. Ironically, it was a new mill, with modern, expensive equipment, operating for only a year. Stability in pricing in the forest products industry would be a good thing to add to our Christmas lists.